.25ACP with about an 8 inch long Barrel. 1. The Bolt conversion is complete and was done by John Taylor of "Taylor Machine" in Payllup, WA. match the angle of my Ruger .22LR magazine. working out the clamping methods to hold everything in alignment for welding. 5. I purchased a "Volquartsen" extended magazine catch/release to install in my MKII grip frame. sending the barrel out of Blued finish. Threaded Muzzle Crown Protector/guide for my cleaning rod. Front Sight boss. I hope no one mistakes it for a "TOY" gun, chuckling. 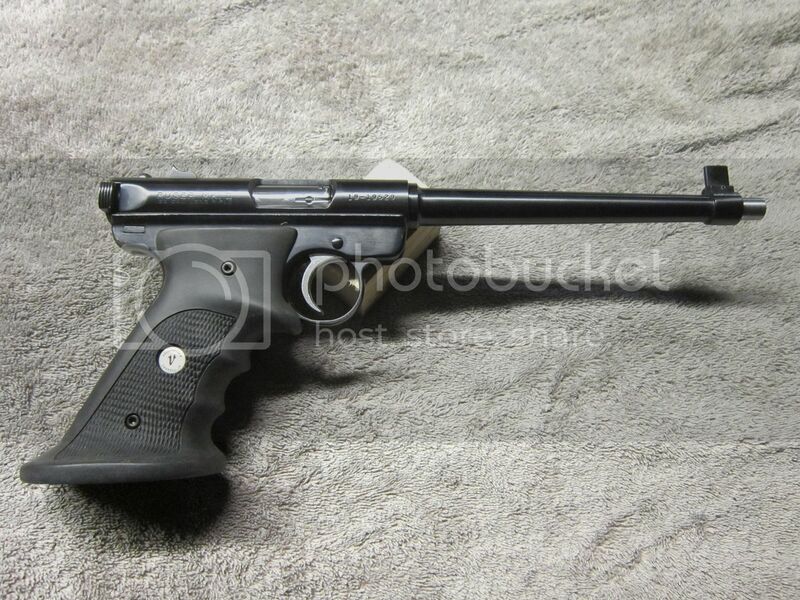 Eventually I will have the rear, fixed, sight replaced with an Adjustable Ruger Target Sight. I do realize this project is not suitable for CAS use but I felt it might be of Passing Interest to the R.A.T.S. group. "Been there, But no 'Tee Shirt' survived. The finish color on all items is a Very good match to my Receiver original Blue finish. Grip frame before Finish application. Now I have "Single Shot" Pistol until I make the Magazine(s) to feed my pistol a diet of .25ACP cartridges. Added: I turned the Barrel Muzzle Threads off using my Friends Lathe so it is now an UNTHREADED Muzzle and California Legal to own/Assemble. My Christmas Came Early this Year!!!! My Fresh Converted Center Fire .25ACP Ruger Standard Auto MKII Pistol before replacement of the rear fixed sight with an adjustable sight. And a view of the Bolt face which shows the enlarged rebate to fit the .25ACP rim along with the round centered Firing pin tip below the original rectangular firing pin channel with the Ruger Recoil Assembly in place. 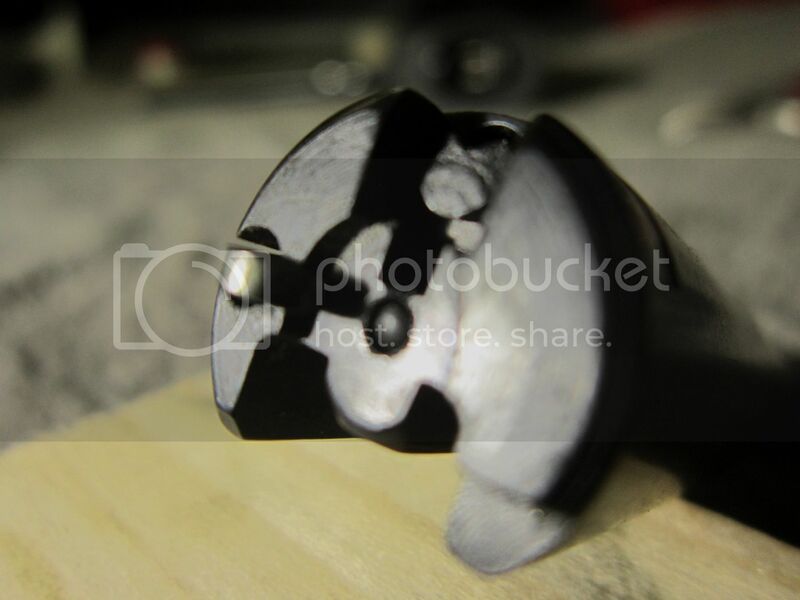 Note the Bolt is about 3/4 inch diameter It slides into a .750" ID drill bushing with little or no 'slop'. This Handgun is still a "Single Shot Auto Eject" as I have no magazine to feed it with yet. I will need to make them. I have High hopes for both its innate accuracy and my wrist strength to "off Hand Standing" shoot and hit 100 yard Gongs, something I have yet to consistently do with my Single Eight revolver. December 27th I 'took a Range day' at my loal Outdoor commercial range. I fired a few firearms for fun and relaxation and for Functional testing. Pistol staring out 'patterning' high and to the Left at 7 yards. screw had an Allen socket head so I could not adjust it at the Range. as a Single Shot also. - Bolt 'recoil' was about the same between the two pistols. - Muzzle rise was about the same between the tow pistols. - Both seemed to feel about the same 'muzzle heavy' without the Magazines. Note this was 'Standing Off Hand' and I believe both are More Accurate than I am. The range was too Crowded to get to try them from a rest position. All in all a good day was had. looking better and better accuracy wise. correct POI to match POA. remaining two new 8-shot cylinders in .25ALR and .25ACP soon. My March Funds were taken up by my two dogs annual Vet. visits and buying their annual Licenses. No Progress on the .25ACP Magazine yet. 'RCC" is now listing CNC turned Brass 22LR CF cartridge cases for sale at $3.75ea with a minimum order size of %0 cases. Now I have the Option of buying cases and bullets and shooting .22LR size cartridge switch my CF converted bolt by switching it to my 'pre-mark' Ruger Standard Auto Pistol.